↑ United Nations General Assembly Session 36 Resolution 67. International Year of Peace and International Day of Peace A/RES/36/67 էջ 1. 30 November 1981. Retrieved 2008-08-23. 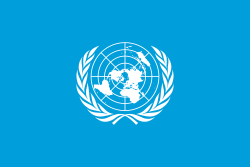 ↑ United Nations General Assembly Session 55 Resolution 282. International Day of Peace A/RES/55/282 7 September 2001. Retrieved 2008-08-23.